I found a new craft that I just HAD to do! Where did I find it? Pinterest Duh!. Actually I didn't find it, but my friend Mandy from Totes Delish did and lucky me, I stumbled upon it! Here is the full tutorial of the wreath. Once I find something, I want to begin working on it ASAP. So immediately after work I went to Michael's to pick up the supplies. One problem: I started doing the math and realized that 45 yards of ribbon was going to be expensive! Maybe I'll just buy each spool one at a time with a 40% off coupon each time. At 3 yards per spool, that would take FOREVER! When I get an idea in my head, I want it now! It's a problem, I know. Anyway, Michael's had a good selection of ribbon and the foam wreath I needed. I used the 40% off coupon on the foam wreath which brought it to $4. After I bought everything, I spent $30. Not bad! I only ended up with about 35 yards of ribbon because I was still having a hard time needing another 10 yards! I figured I could always pick up extra ribbon and this would be a good start. Here are the 6 different types of ribbon I used. 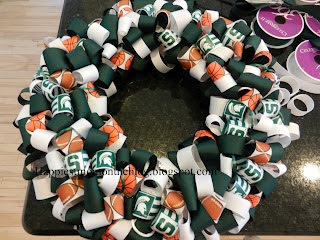 I started with one color and sporadically placed the ribbon all over the wreath. Here is my wreath after 2 colors. Now I think it needs some sort of embellishment. Maybe a football hanging in the center, a big bow, or a helmet in the corner. I need to decide. One thing I have decided is I am making one of these for every holiday! It's easy and fun. It can be cheap too if you buy your ribbon on sale. this is so cool, melissa!!!! i love it! Dang girl! You've got mad skilllllz :) These look amazing. YOu should sell them on Etsy. So simple but the effect is sooo cool!